Friend Roxanne Wells not only suggested William Kent Krueger’s novels (set in Minnesota), she lent me the ones she has, which is all of them but the one coming out this summer. Guess what I do at lunch these days? And late into the night. Reading Krueger is a bit like reading Paul Doiron’s books about a Maine game wardens solving murder mysteries. Friend Lynn Vermeulen sent me this card, and I burst out laughing when I opened it. My friends know that I have been watching ALL of Project Runway and PR All Stars this winter–another piece of mischief fomented by Roxanne Wells. The key saying in every program, just before the judging begins, is the following: “As you know, in fashion, one minute you’re in, and the next you’re OUT.” Lynn’s card statement finishes with a happier ending. I feel really blessed with my friends and family’s attentions. My birthday was great. We have two feet of snow on the ground and a cold snap, so the snow isn’t going anywhere fast. But it is very pretty, and the days are longer, and the birds are singing. And, the female turkeys have joined up with the males–which means the breeding season is starting. They all know I’ll throw out some black-oiled sunflower seeds when there is snow on the ground. They were all here this morning. They come look in the windows if I am too slow in feeding them. 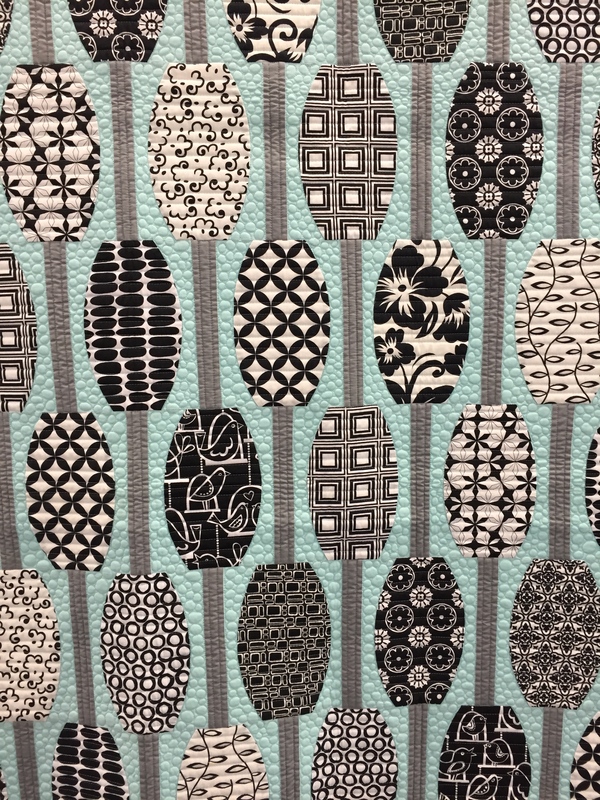 Look at this design wall! 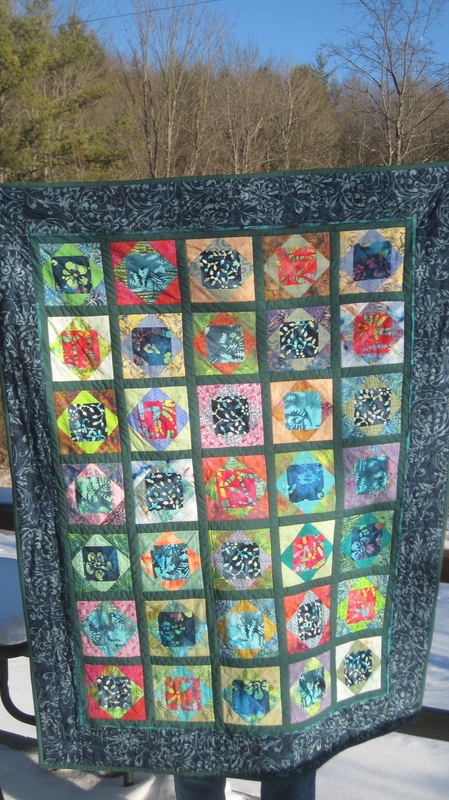 There is a whole lot of fun going on in my house: The scrap quilt with “made” fabric, upper left. Valse Brilliante. 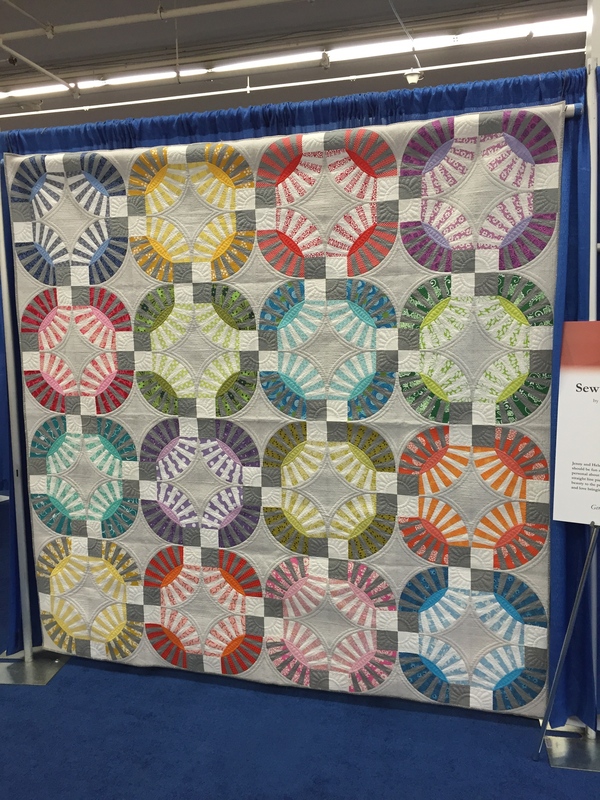 A big block selvage quilt in “cool” colors–using a larger version of Amy Friend’s design. Bonnie Hunter Garlic Knot and Wild and Goose blocks. Assorted foundation pieced log cabins. 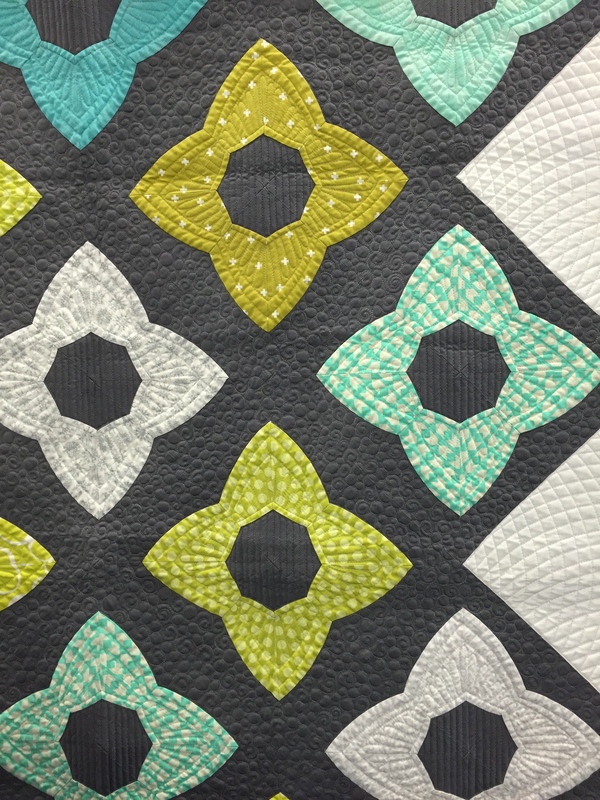 A “cool” neutral block from SUNDAY MORNING QUILTS–this one by Cheryl Arkinson. 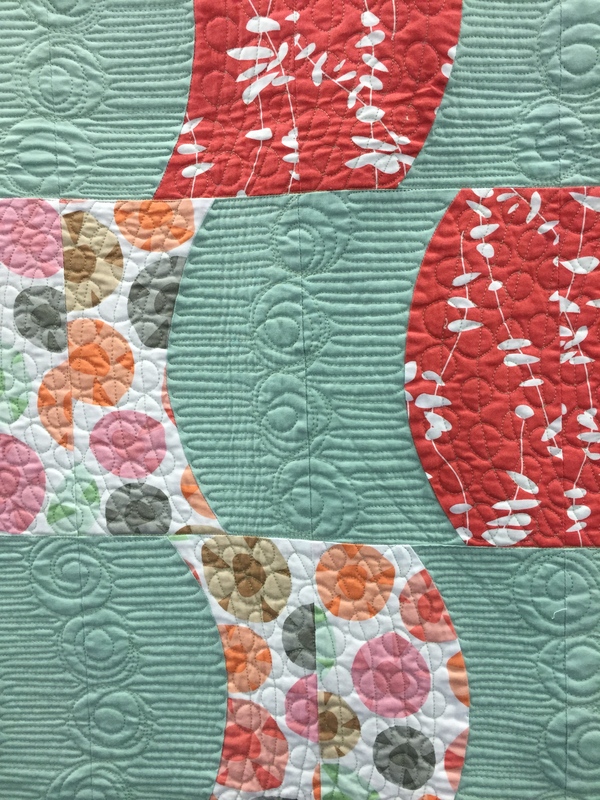 AND, Long Time Gone quilt blocks. LOL. 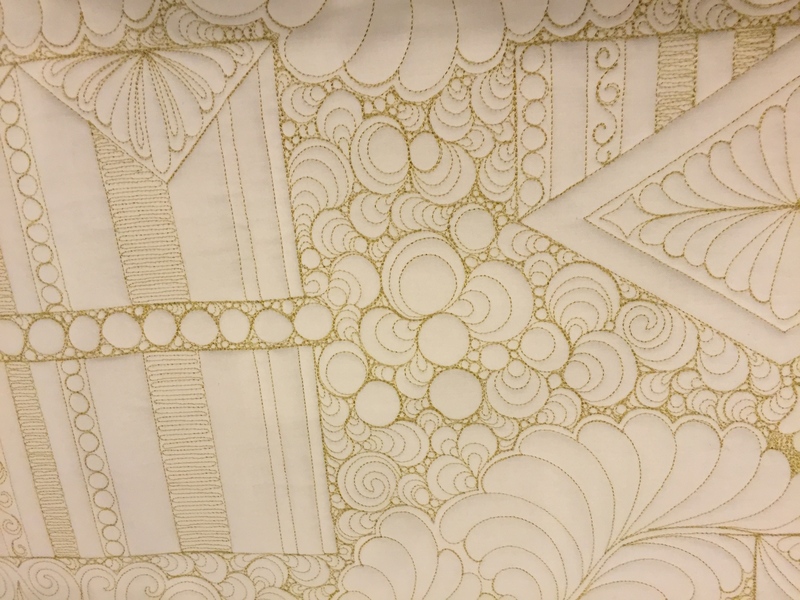 The bed in the adjoining bedroom only has ONE big quilt ready to quilt on it and ONE little art quilt with a design I made. BUT, I have to confess it has a pile of knits ready to be made into tops and skirts and, yes, one dress. I’ve almost finished another selvage placemat. This is the quiet selvage, not the written ones. 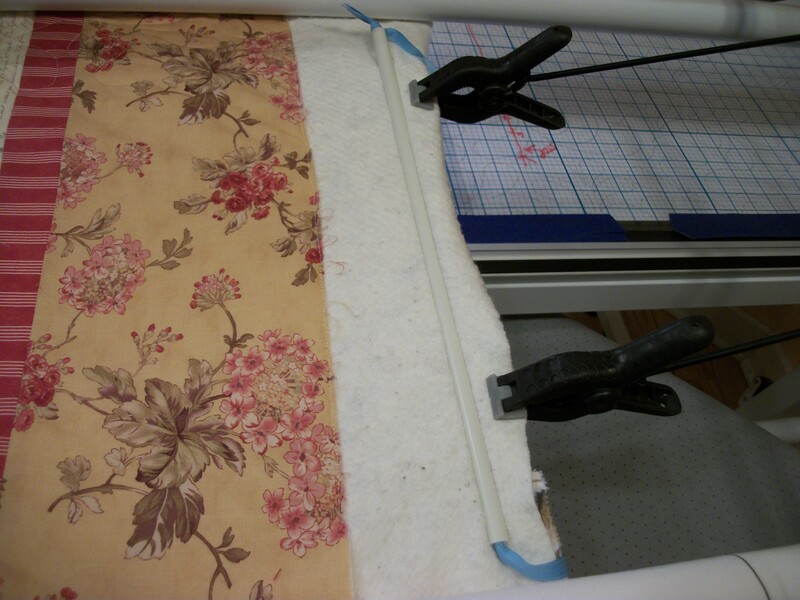 I string these selvages as I cut fabric, and when I get a lot, I stop and knit them into the placemat. 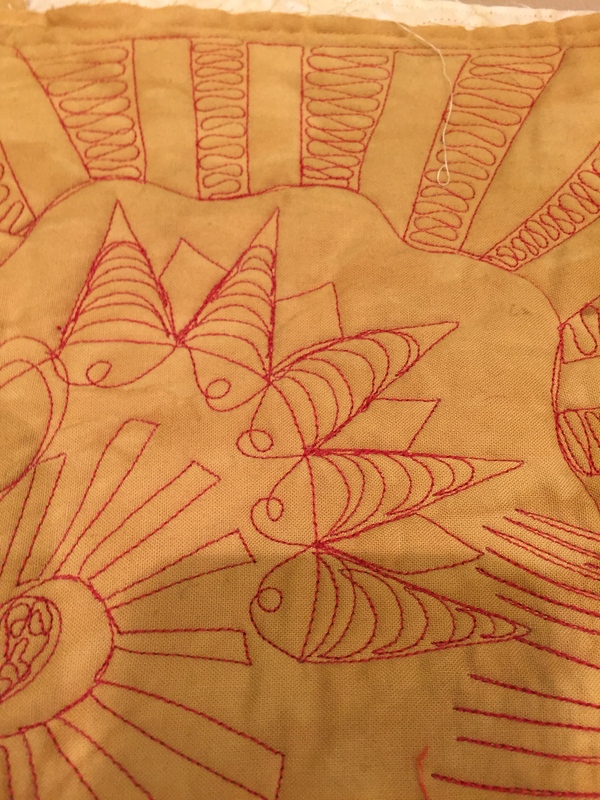 I like how a bright napkin pulls colors out of the placemat. 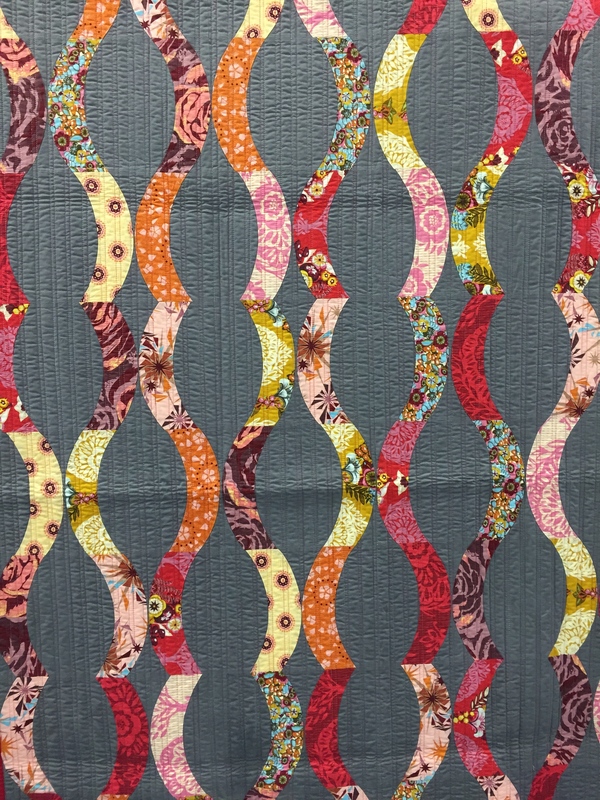 I spent a chunk of yesterday ironing and cutting 2 by 8-inch strips from my “warm” Cotton+Steel neutrals. Yes! 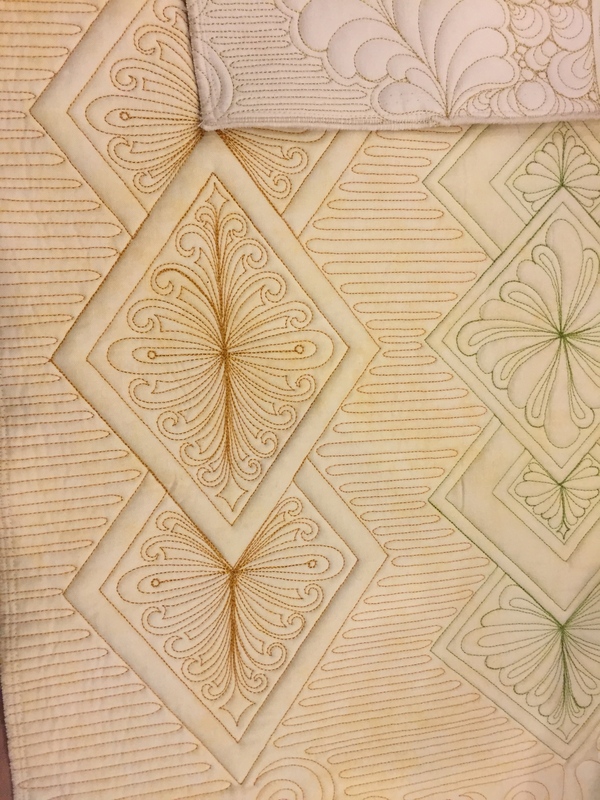 A “warm” “vanilla” quilt is in process. AND, Marsha Green sent me this picture of her blooming amaryllis plants. Marsha has a GREEN THUMB writ large. I didn’t start any this year for some reason, so it is fun to see hers. Marsha and Harry’s garden is glorious in the summer. 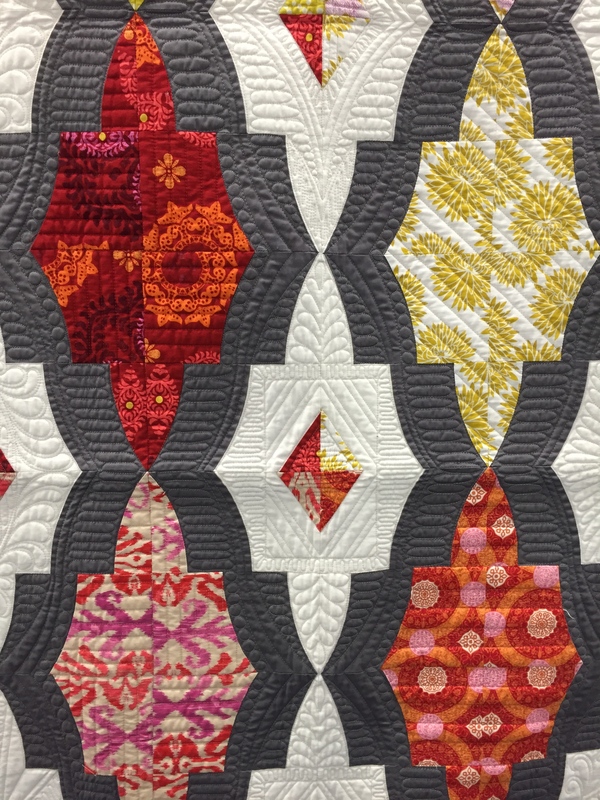 I’ll post pics of this month’s “Long Time Gone” quilt blocks I made when I’ve finished with the adorable little 3-inch churn dash blocks. 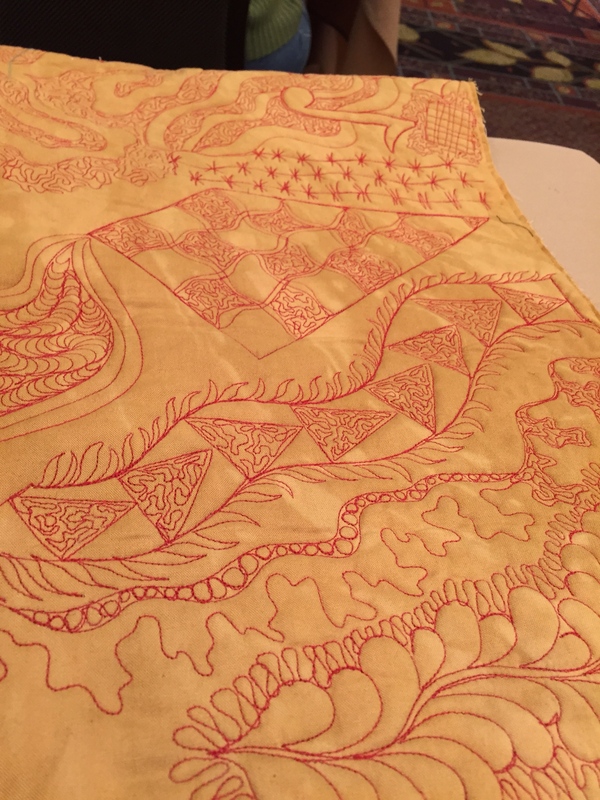 Meanwhile, Heidi August sent a pic of where she is now with this project. 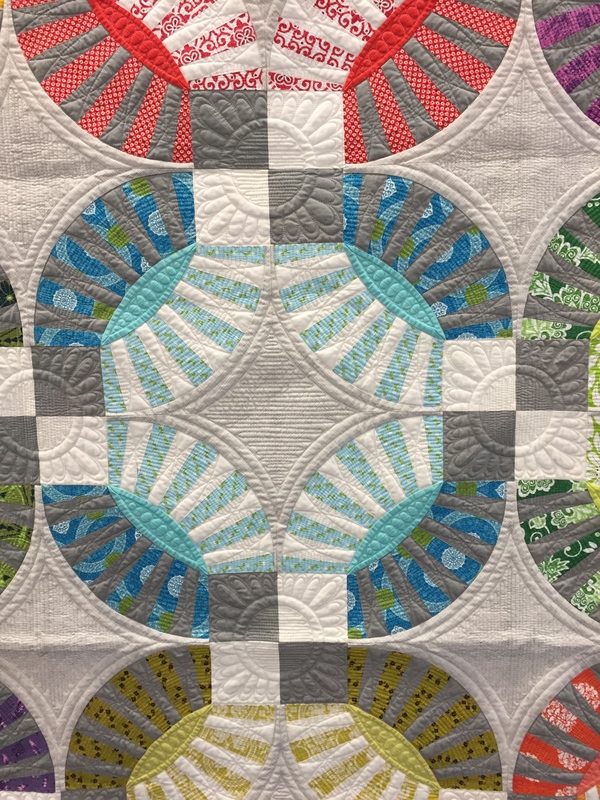 She says she loves the Creative Grid Pineapple ruler, so I ordered the mini one for these mini blocks. 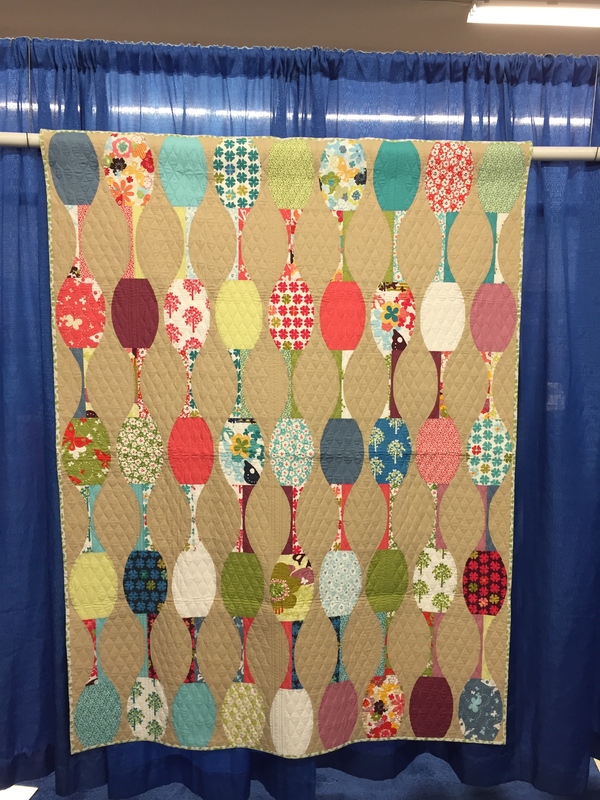 Becca is one of our Coastal Quilters members. I love, love her work. 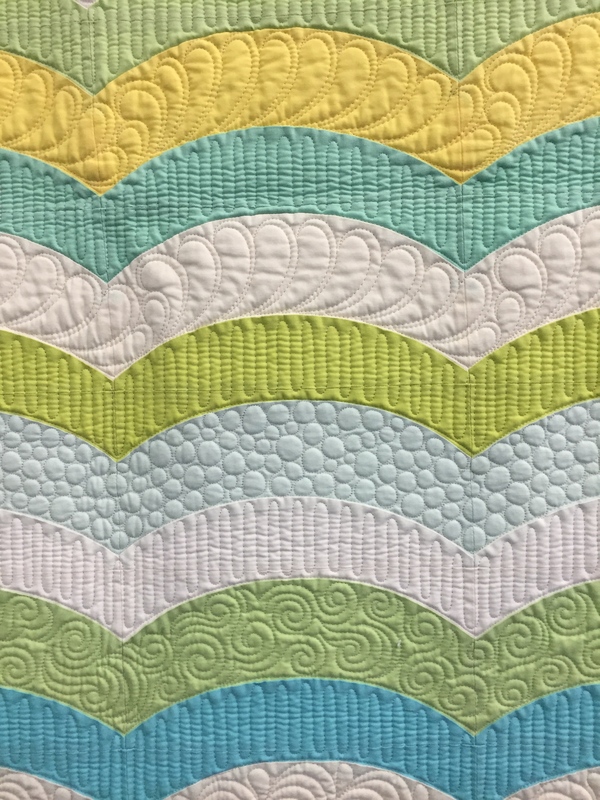 Here’s a quilt she made by using all the “modern” neutrals combined with contemporary warm and cool colors. 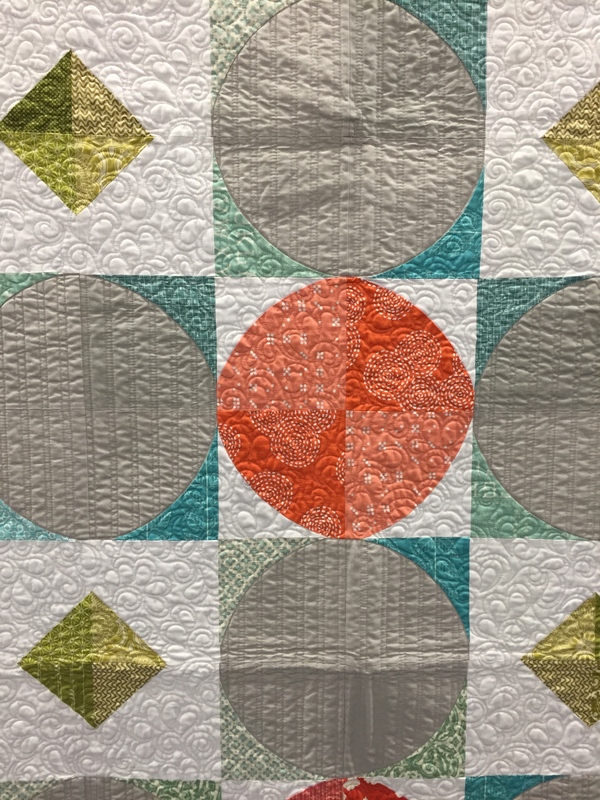 I am so drawn to all the neutrals that are around today–and have a stack of them I need to start cutting up and using. 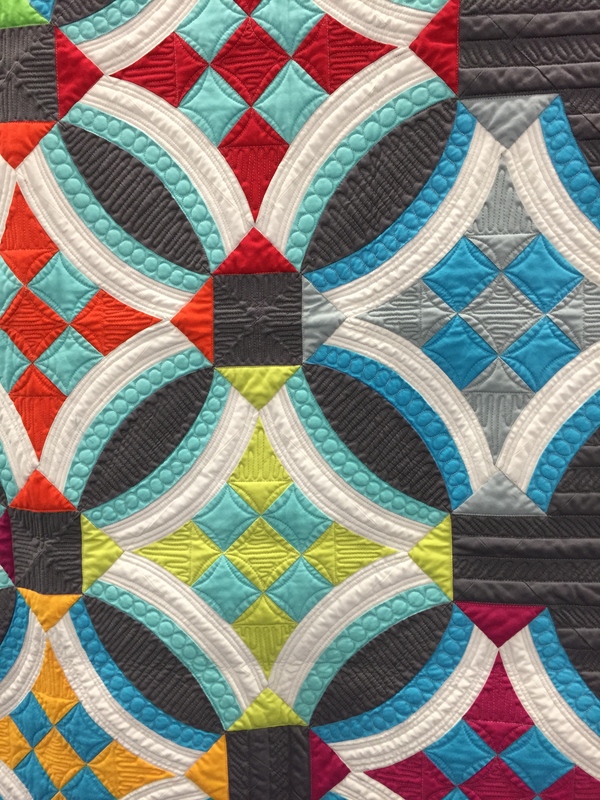 Becca also has an etsy store where you can see the kinds of modern fabrics she likes: SEW ME A SONG. 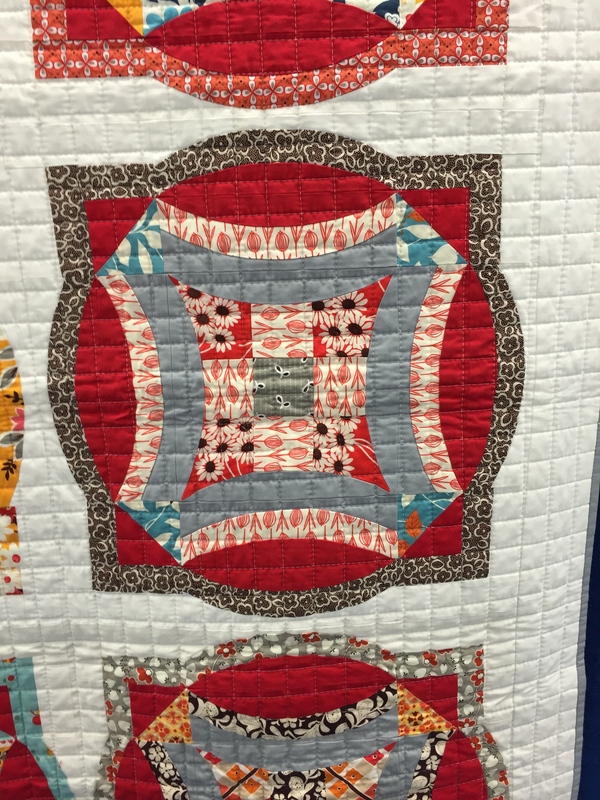 I am just back from the Machine Quilters’ Expo, held in early April in Manchester, New Hampshire. I took four classes and really learned so much. The teachers were Judi Madsen, Judy Woodworth, and Angela Huffman. I used to free-motion on my domestic machine a lot. 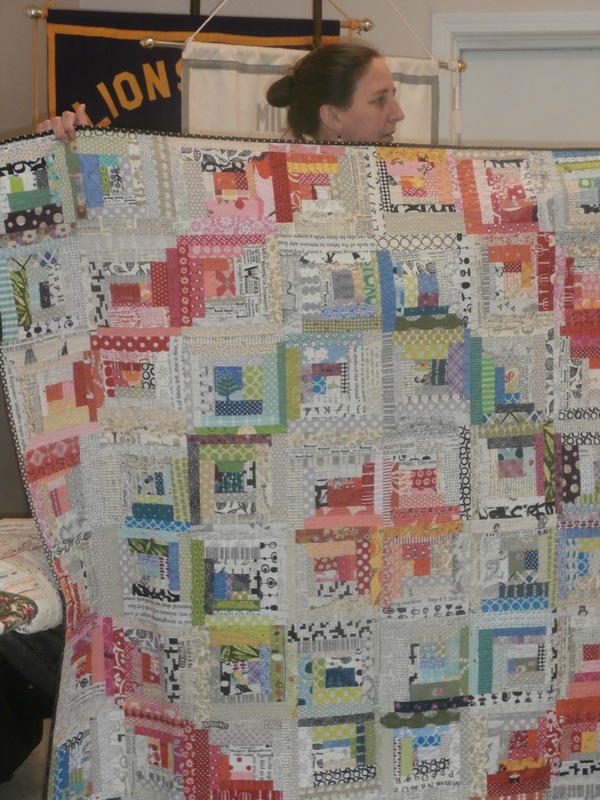 But when I got my long arm, I settled into making the kind of quilts I love the most: big and scrappy. 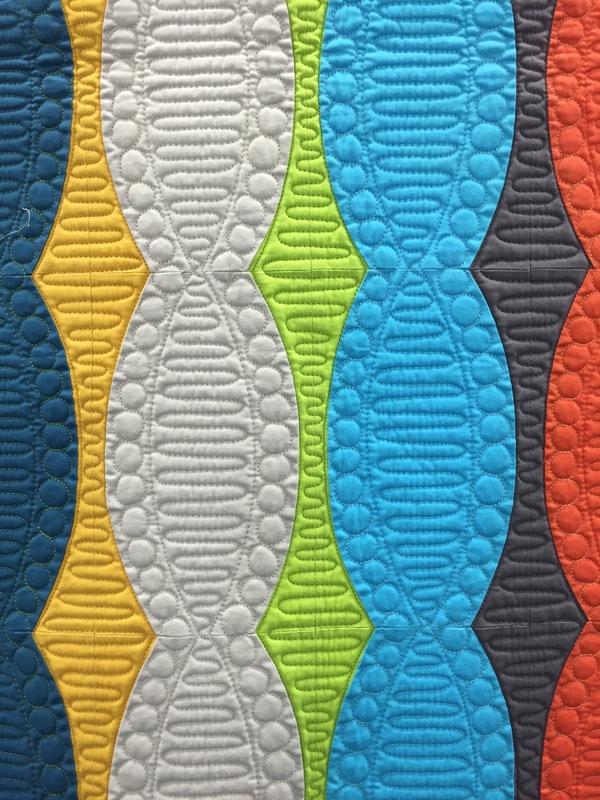 Those quilts really look their best when quilted with an even, overall pattern. 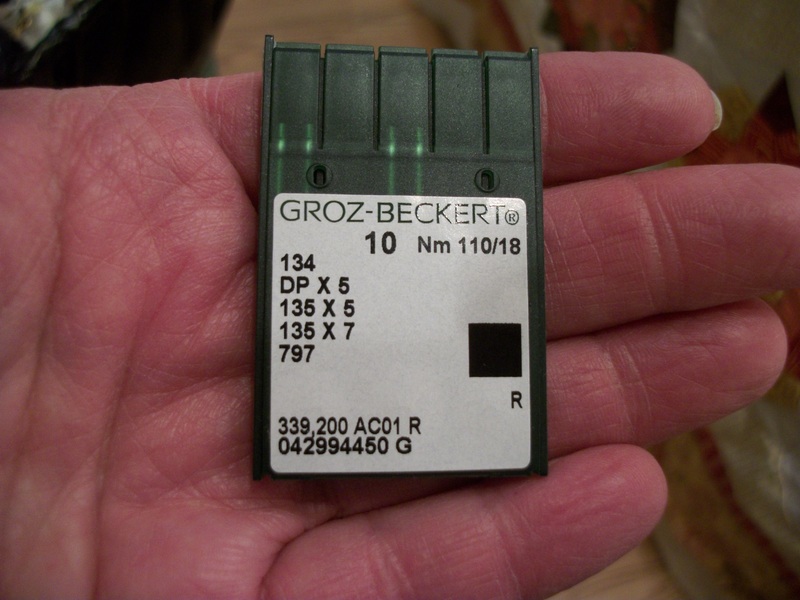 Thus, I’ve been using pantographs most of the time. However, I do not want to lose my free-motion skills. 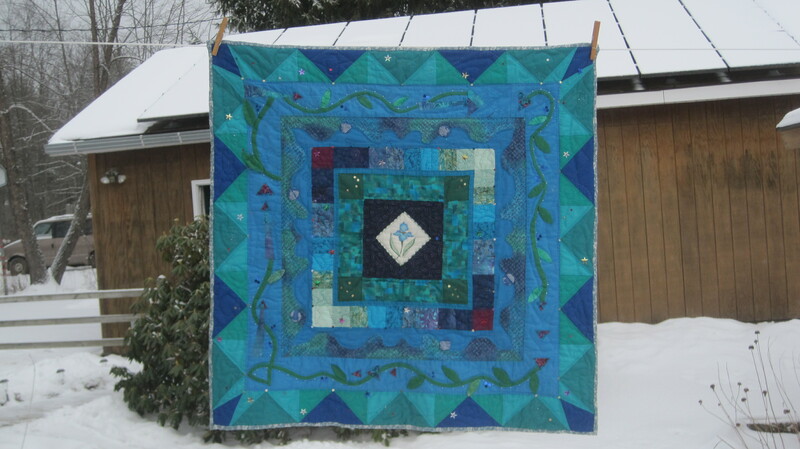 And I do make some quilts that would look great with more custom quilting. So, I have a goal of improving my “front of the machine” skills this year. Angela Huffman does it all. She spent her time teaching us how she works. She uses free-motion and templates. 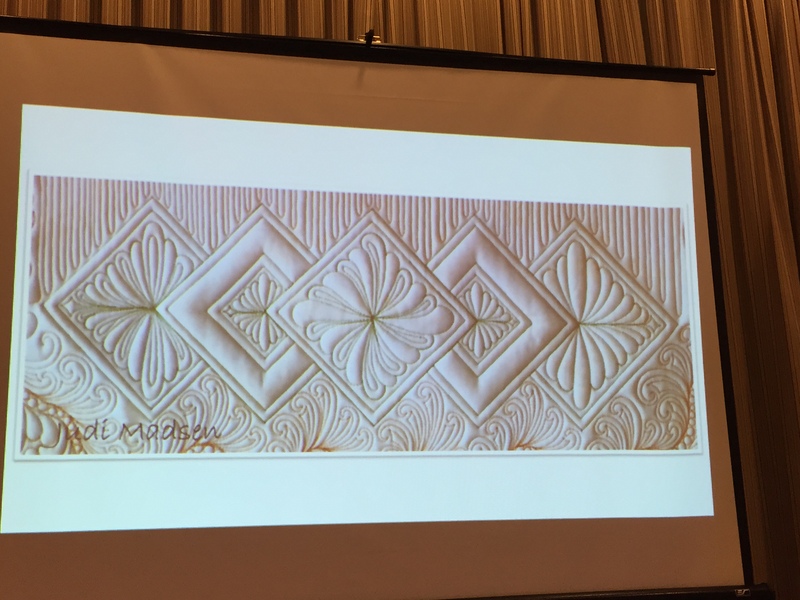 She taught us so many patterns that I will definitely be able to use. 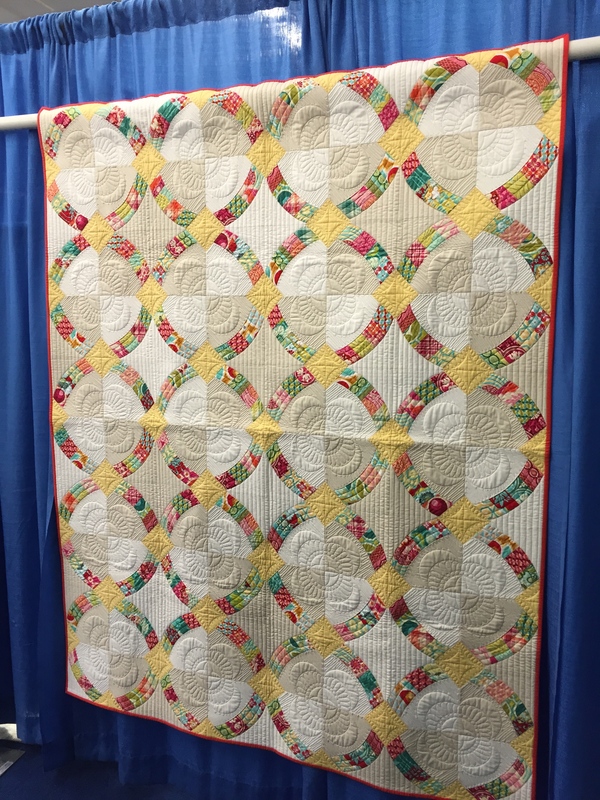 Her web site is http://www.quiltedjoy.com. 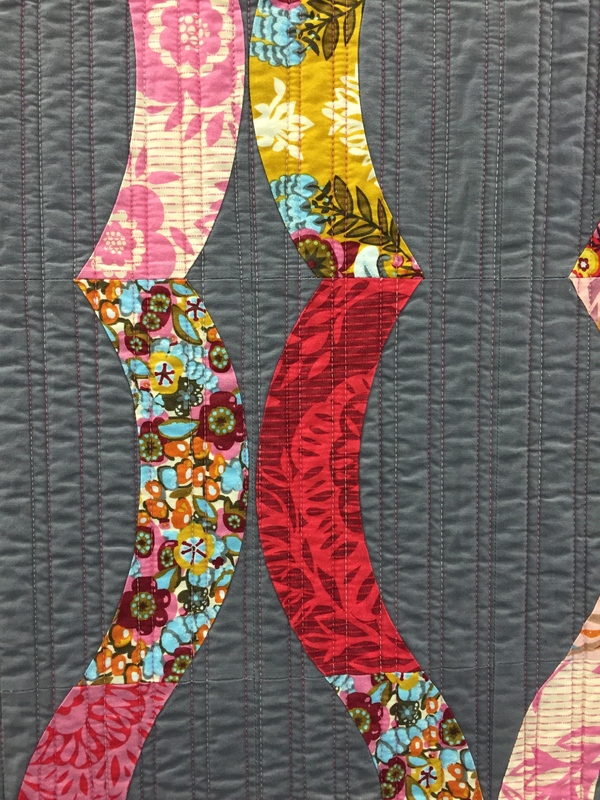 Modern quilter Judi Madsen’s work is so beautiful. Here are some examples–which she broke down and taught us to do. (Of course it takes practice.) 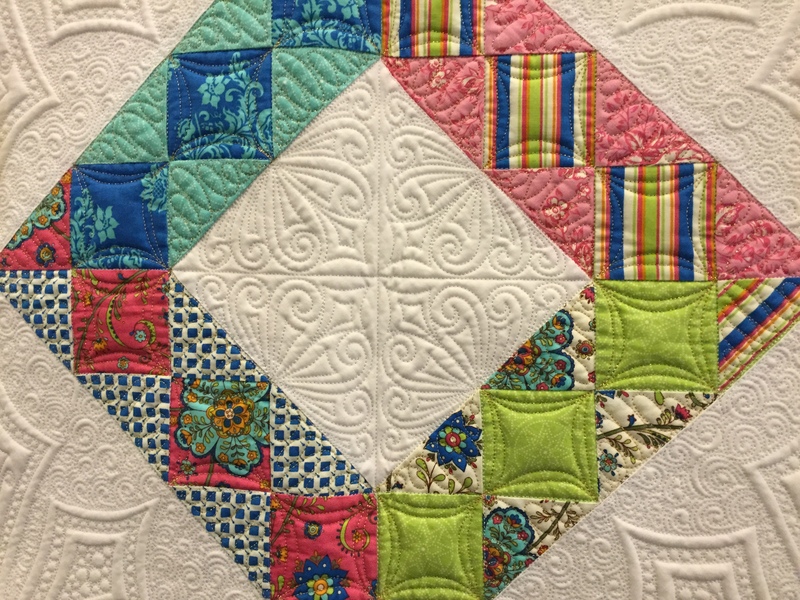 Quilting at this level often involves layering two wool battings to get the trapunto effects. 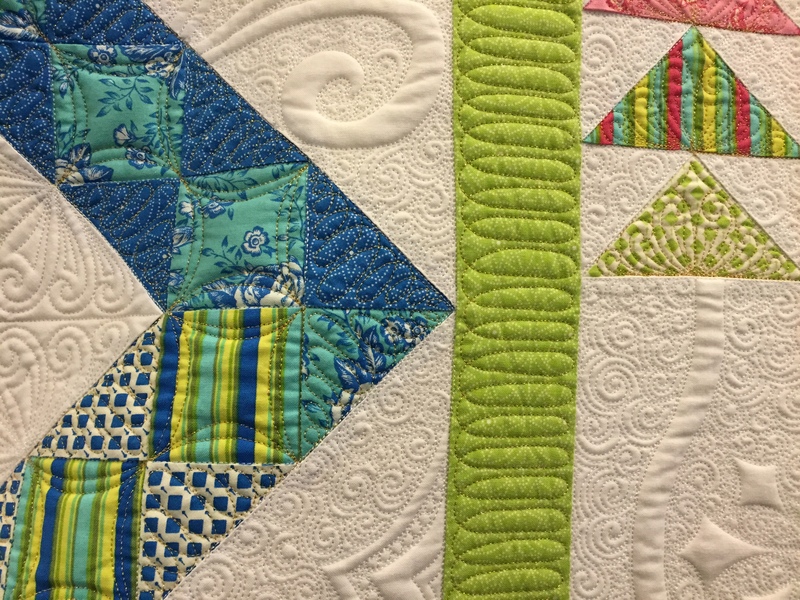 AND, lots of marking on the quilt, a straight ruler, and MATH. 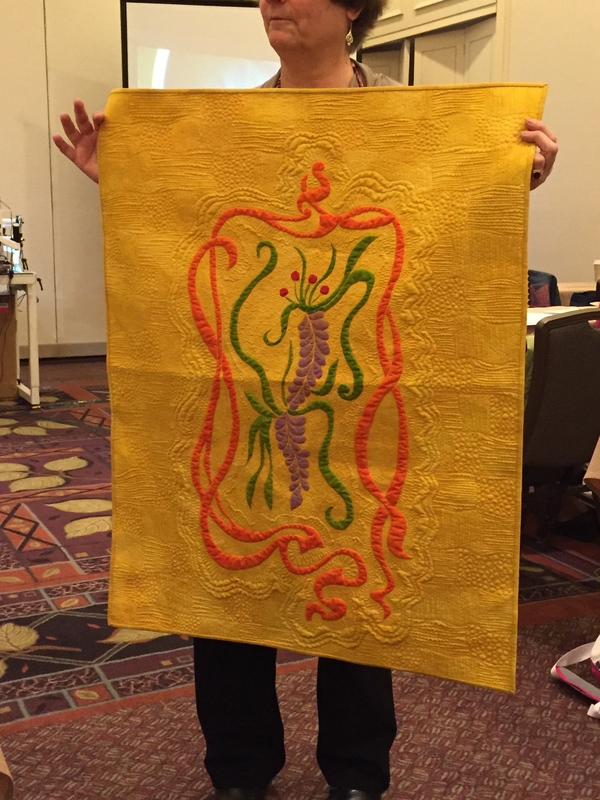 Judy Woodworth is more of a traditional quilter, but I think she can do anything she wants to do. Here she urges us to just have fun and experiment. Judith lives in New York. We met on my blog, and we chat back and forth on email. 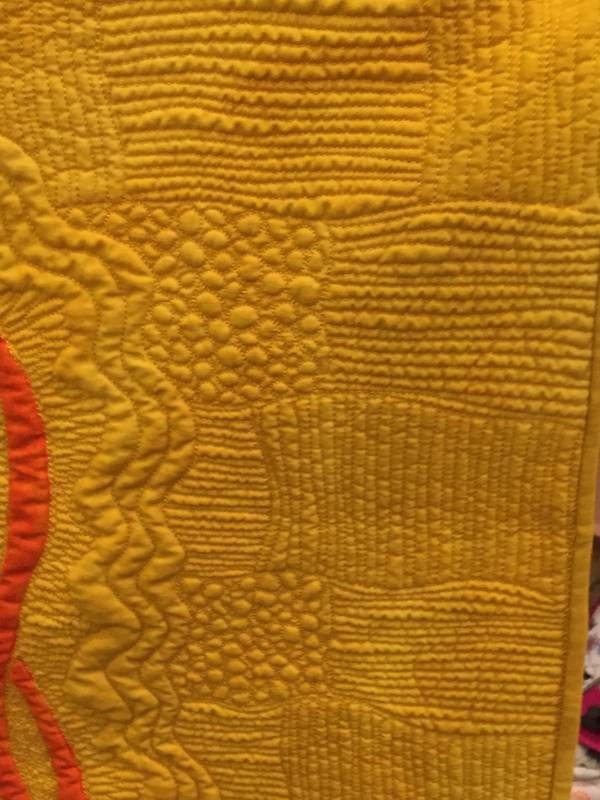 Judith sent me these pictures of two quilts she will be hanging in a quilt show in Cooperstown, NY. Keep up the good, good work! 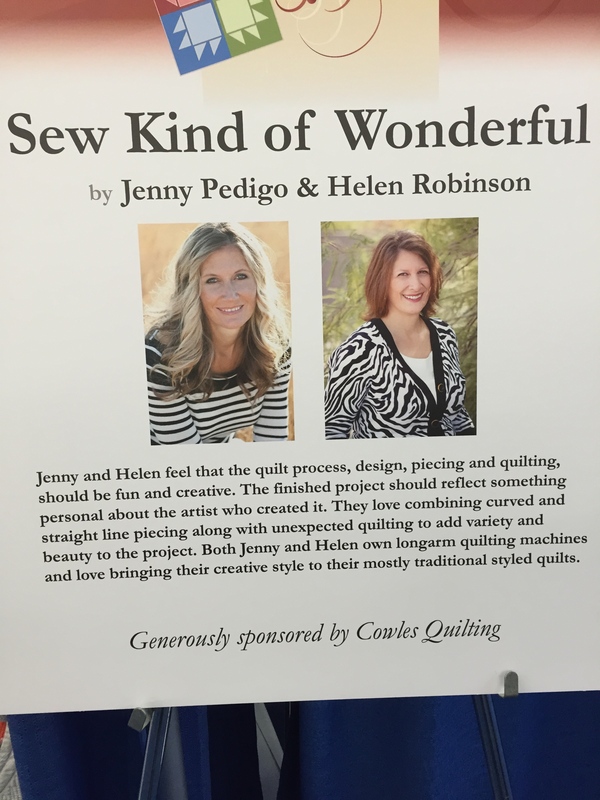 Last year in April I took several classes at the Machine Quilters’ Expo in Manchester, New Hampshire. 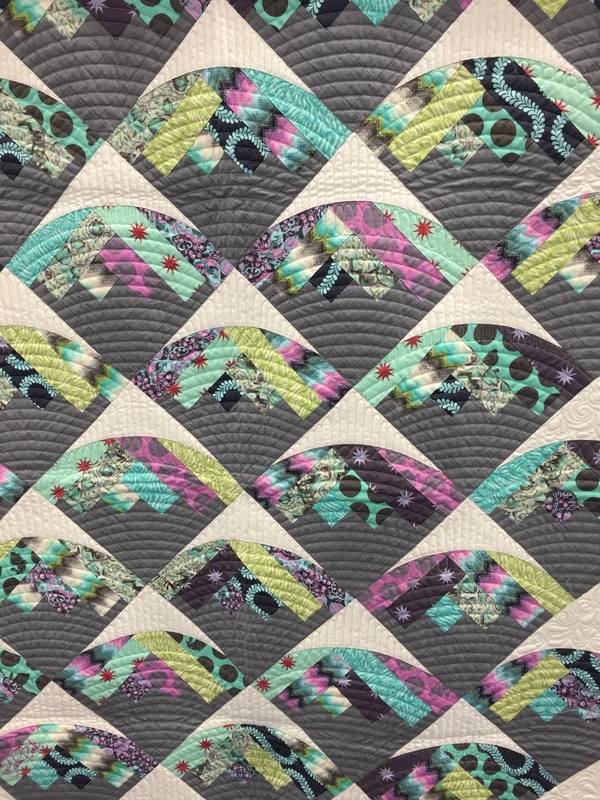 What I learned there–and also what I’ve learned from the long-arm quilters on Bonnie Hunter’s Facebook Studio for Quilters–has helped me so much. Make sure your bars are level. Get or borrow a four-foot level and check them. If they are off, tinker until you have them level. I load my quilt backing in the normal way. But after being encouraged to do so, I float my top, just like the batting. See? 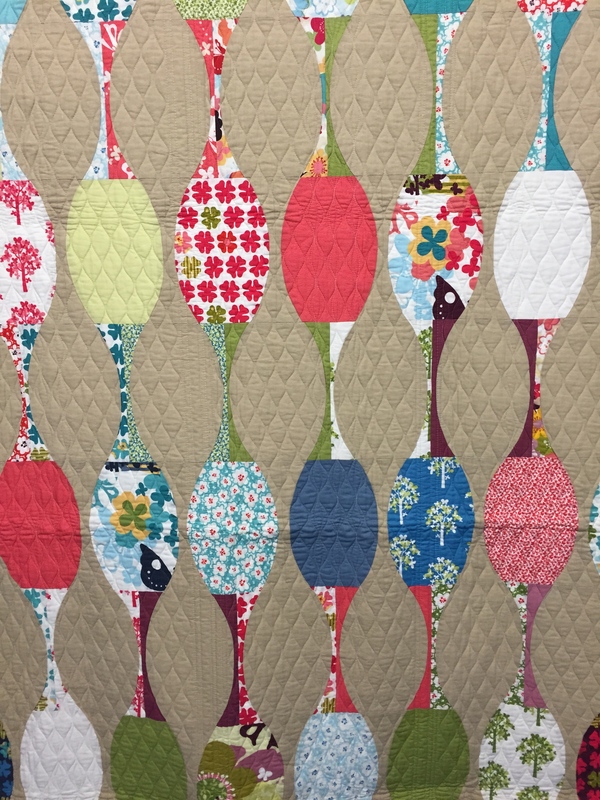 I sew a plumb line on the batting (using my channel blocker piece), then line up the top of my centered quilt on that line–and sew it down. 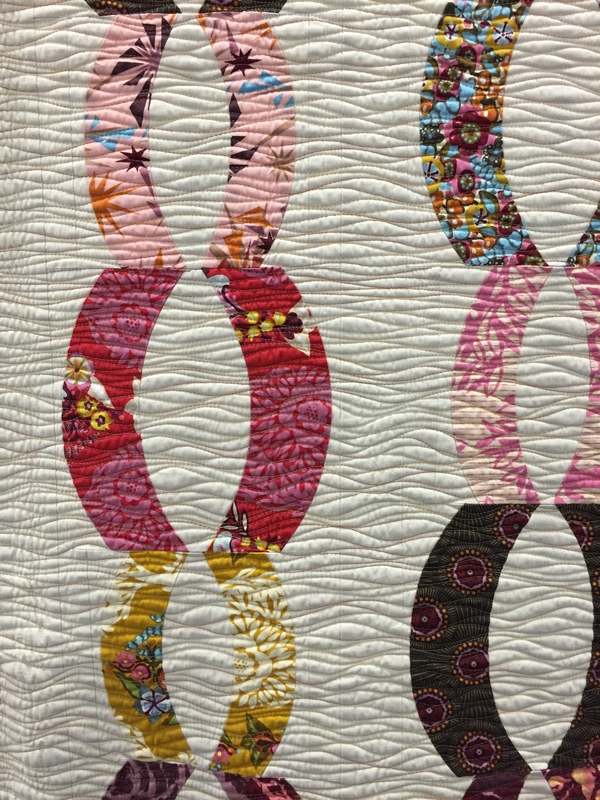 THEN I measure both sides of the quilt from the frame on each side and as I move the quilt forward, I make sure that I keep those measurements constant along the length of the quilt. 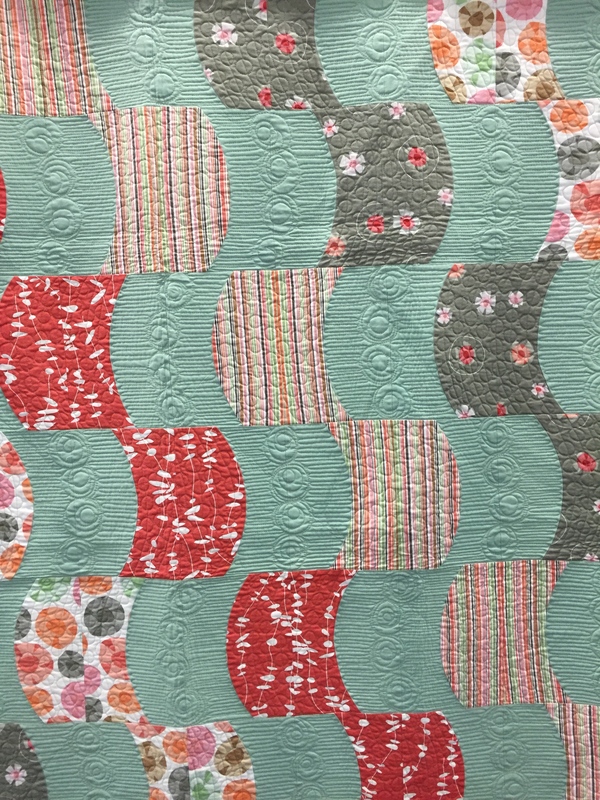 I sew down the sides every time I roll the quilt forward. Every time. Especially if I am using a pantograph. 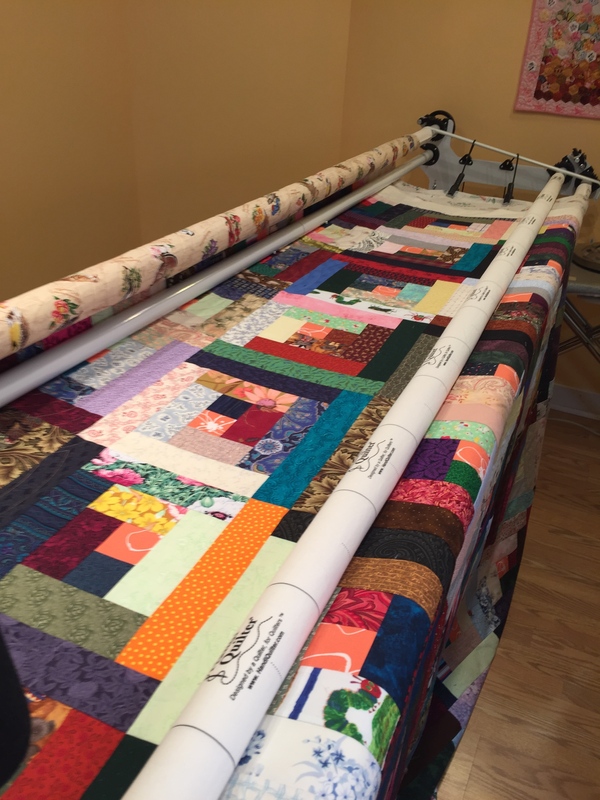 BIG TIP: If I were to roll the top onto the top bar, I would try to place the quilt (and the backing if needed) LENGTHWISE–which minimizes the bulk of side seams being rolled up over and over on top of each other. 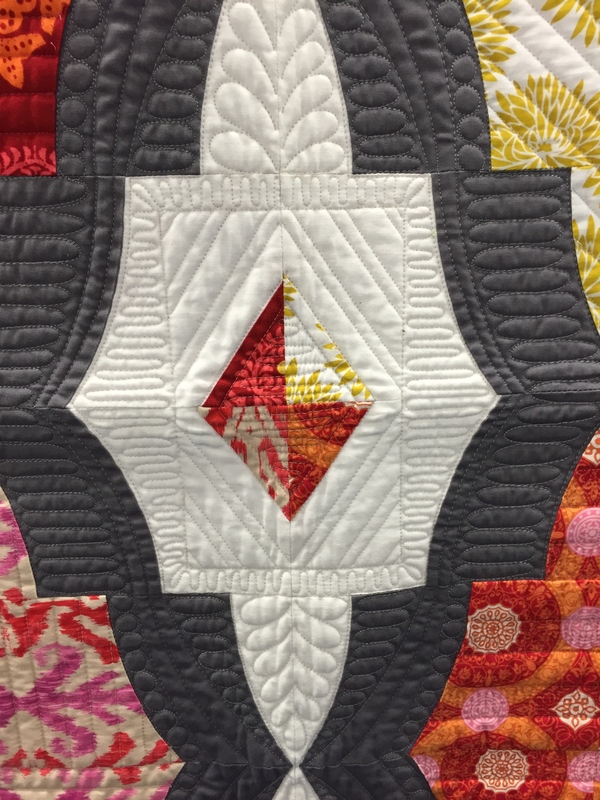 At the end of the quilt, I roll forward to expose the end and sew that down before making the last pass. 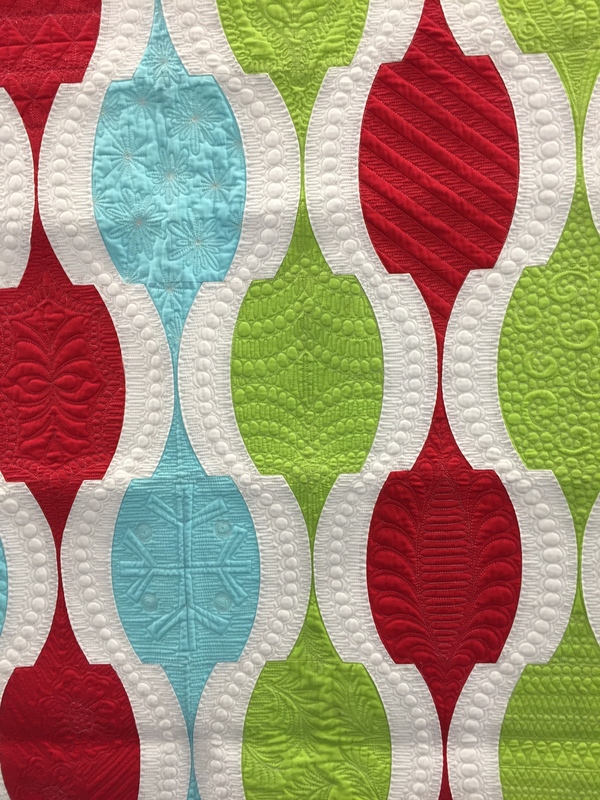 I make a lot of scrappy quilts that seem to do best with an overall, even pattern. 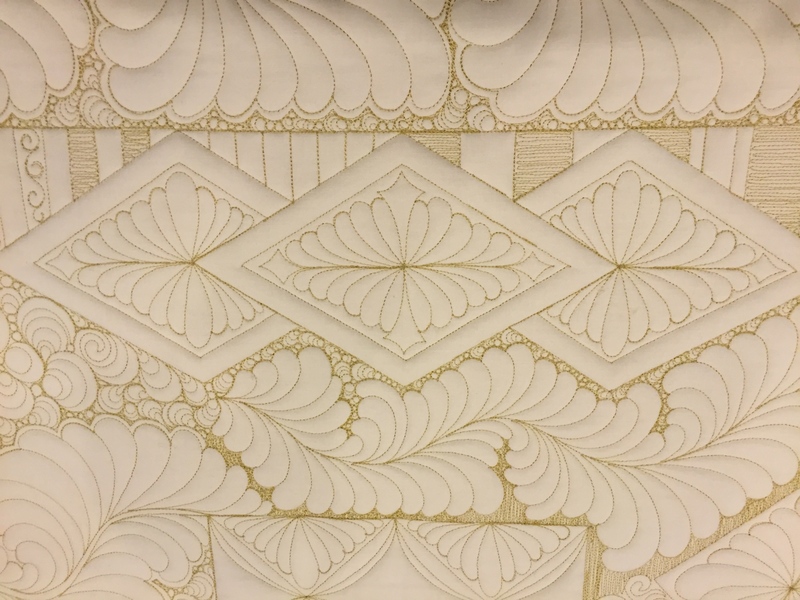 So I use, mostly, pantographs–sometimes I free-motion a pattern, but less and less so as I like the patterns in the pantographs. 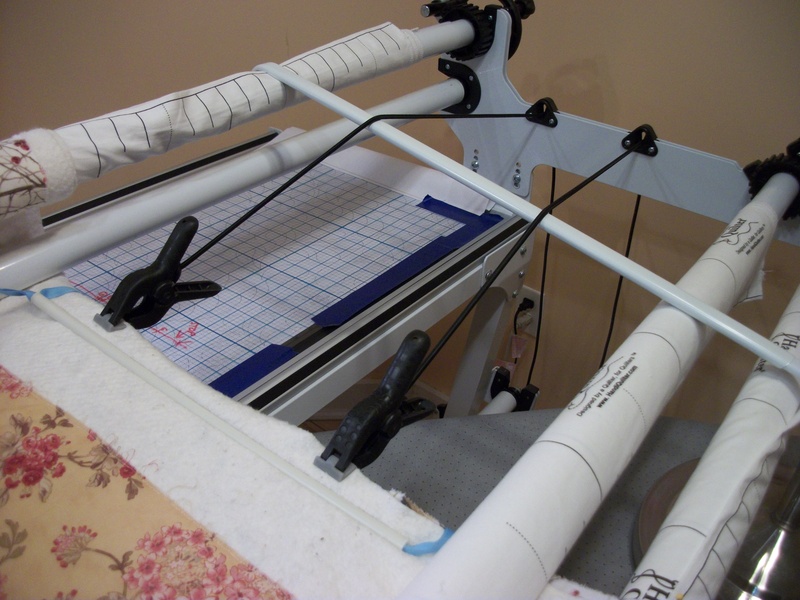 I place the pantograph UNDER this grid that fits the length of my table–and mark on it with a wet erase marker that can be erased with water. 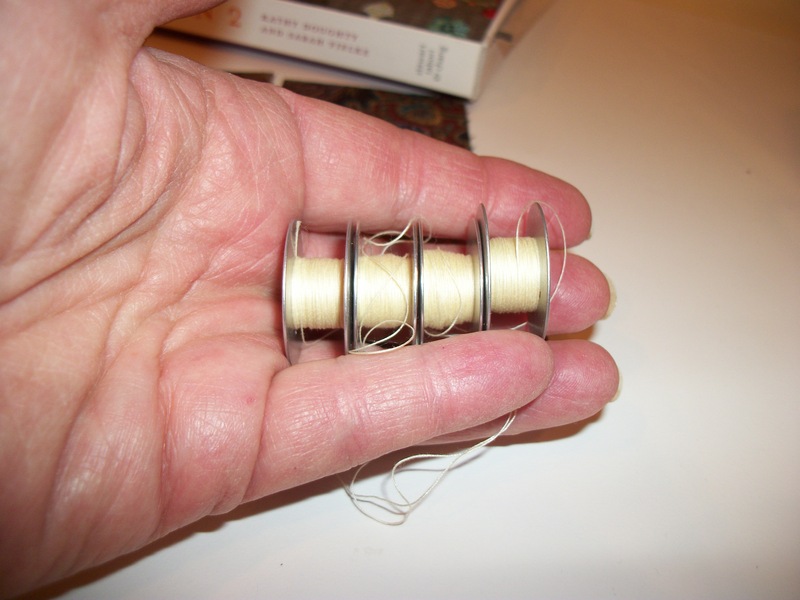 I estimate the amount of thread that one pass will take–and whether or not a whole bobbin will reach through two passes. 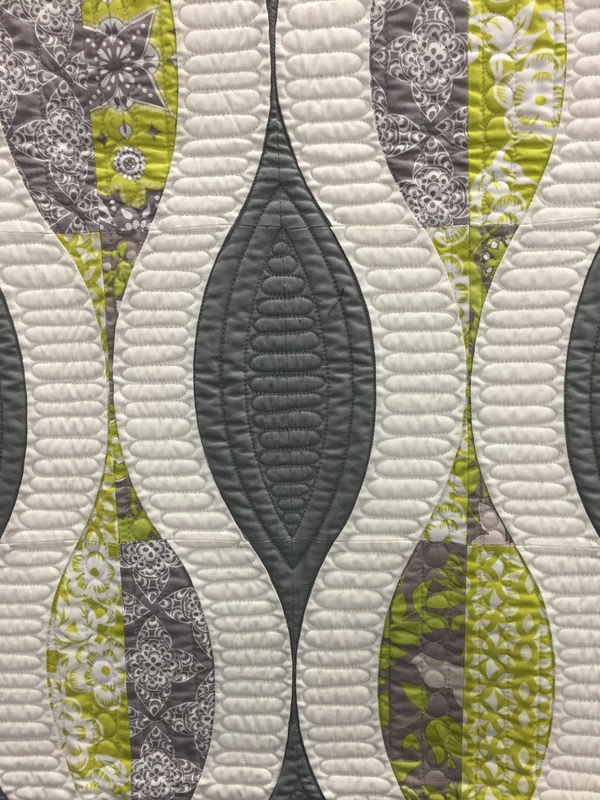 On a large quilt, it will not. 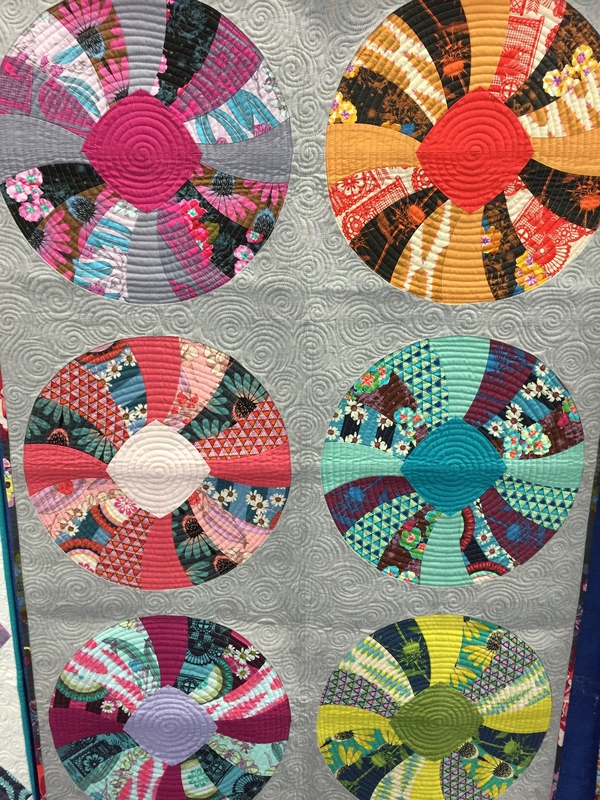 So, I estimate the number of passes I will be making and load that many bobbins–from 2/3 to 3/4 full, depending on what I think the pass will need. The leftover thread gets run off onto bobbins for my domestic machine and/or just used up piecing scrappy quilts I’m making. There is no thread waste. 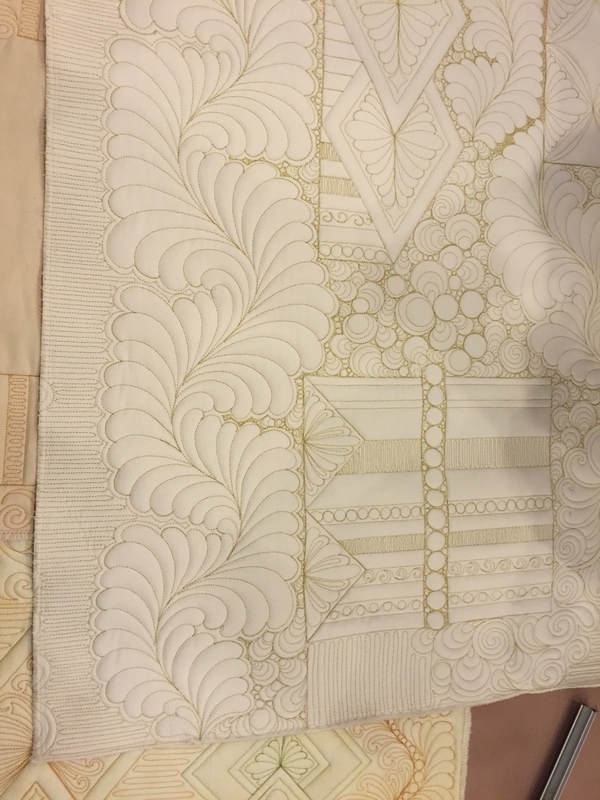 (I also use Signature thread, which is sturdy, has a good range of colors, and is way cheaper than that other brand that is so pricy. I do have to order it online and bought a thread card showing all the colors.) Here are leftover threads. 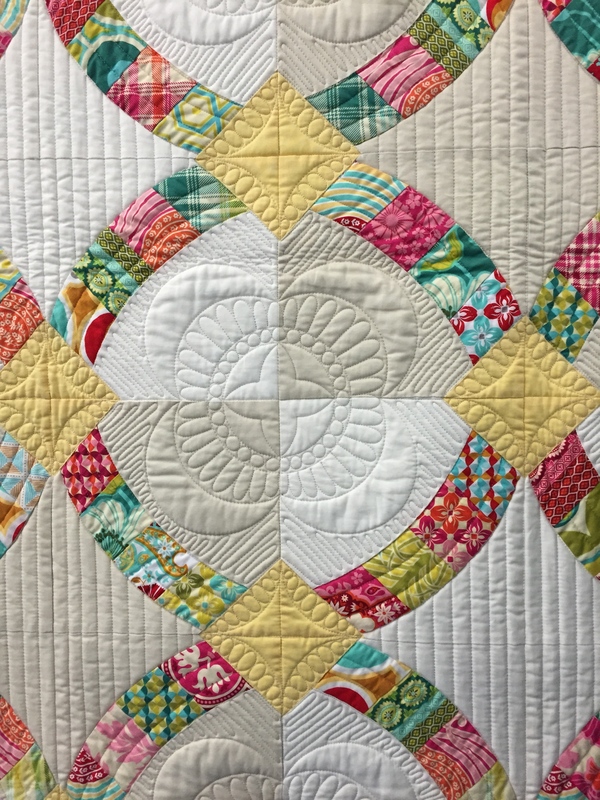 More importantly, there are NO thread joins in the quilt body. 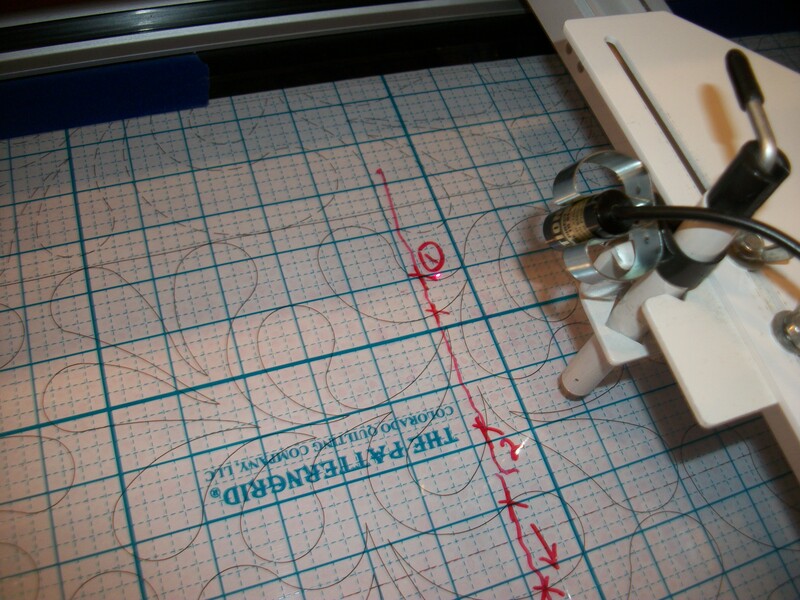 Before quilting, I put three lines of Sew Rite down the length of my thread cone. Magic! No more shredding. If things do start to go wrong, I turn off the machine and walk away. 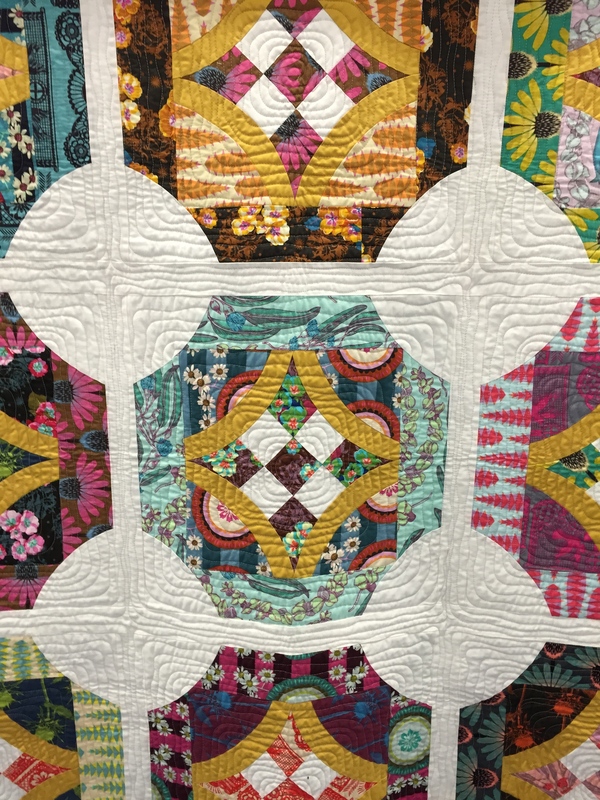 But, I won’t put any pressure on myself, because, truth to tell, what I like best to do is to piece a top that will be used and loved and washed–so a lot of fancy quilting doesn’t draw me. I’m not sure that I have the patience for it!! I love stories, and this one is fascinating. 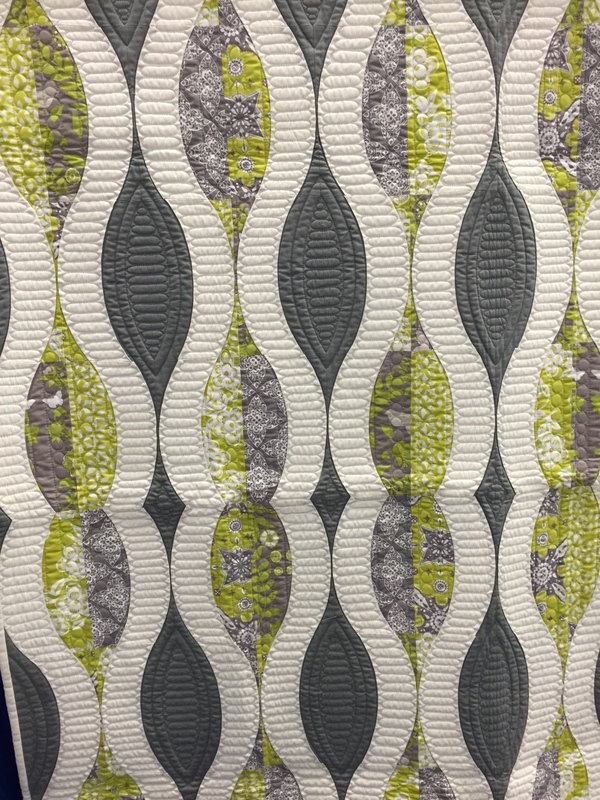 RJR Fabrics LOVES THEIR WORK. And let’s them do whatever they want. 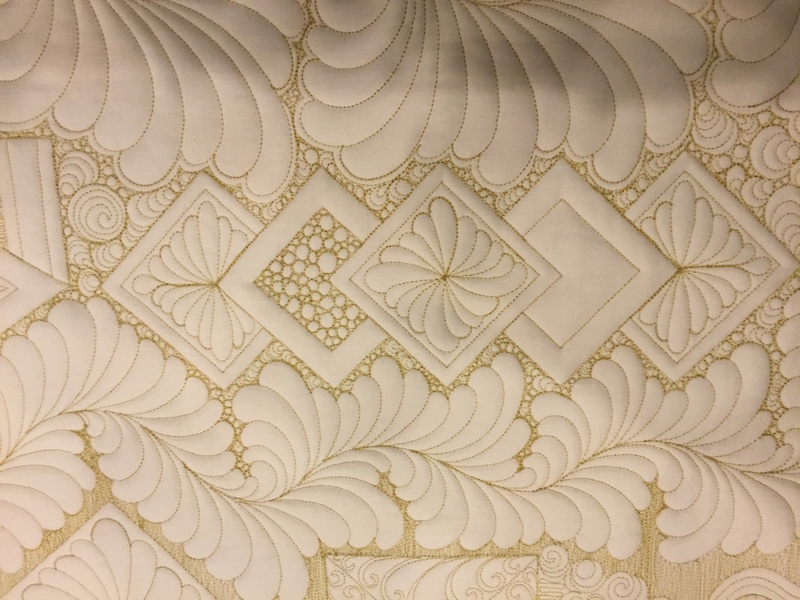 Cotton and Steel — THE BITTER SOUTHERNER. 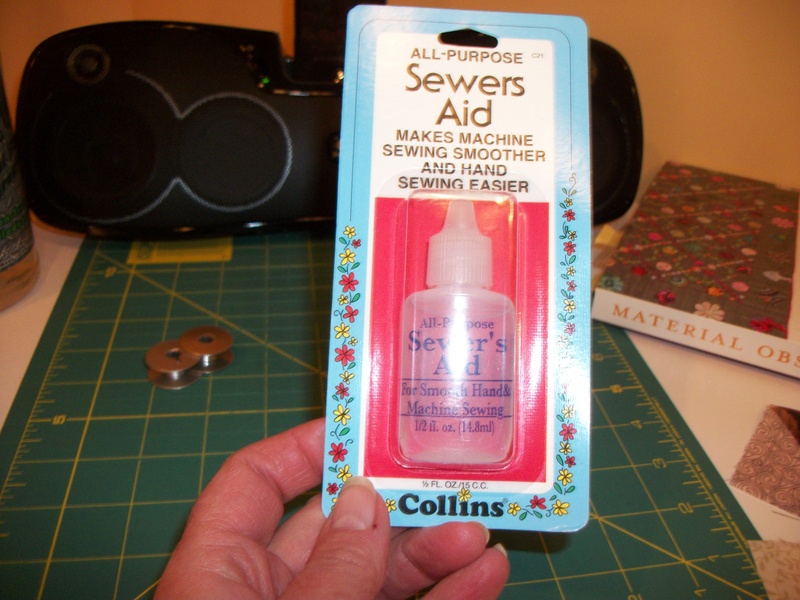 Even if you don’t sew, this story is really fun.